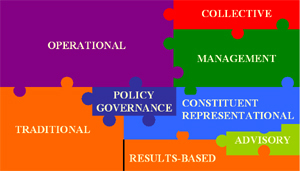 GOVERNANCE MODELS - WHAT'S RIGHT FOR YOUR ORGANIZATION? This article discusses factors that influence a board's approach to governance, describes and critiques eight governance models commonly used in nonprofits and offers guidance on their application. It suggests 'Results-based' governance as an emerging model that nonprofit leaders may want to consider and offers some 'Quick Tips' to guide development of an approach that suits your organization.